United Yacht Sales New Jersey would love to guide you through a personal showing of this 42' Sea Ray 42 Sedan Bridge 2004. 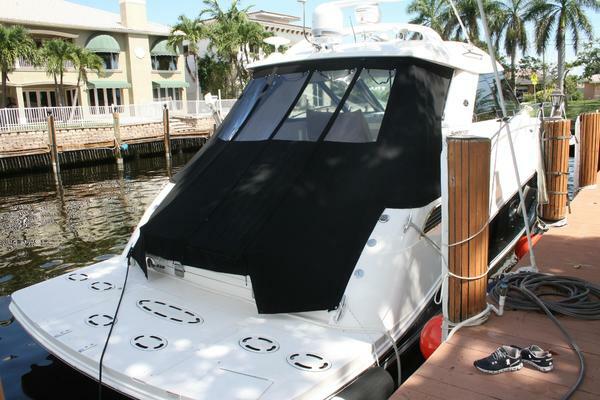 This yacht for sale is located in Orange Beach, Alabama and priced at $220,000. For a showing please contact us by filling out the form on this page and we will get back to you shortly! From her inviting cockpit one enters the opulent main salon though a glass sliding door to entertainers delights with convertible sofa sleeper to port and matching settee to starboard. An entertainment center with television is also to starboard. A raised U-shaped dinette with seating for a large crew is also to port just steps up from her well-equipped galley. Plenty of light baths the entire main salon through large shaded windows 360 degrees.Forward of the galley the companionway features a very convenient guest stateroom, complete with double/twin single berths and a large cedar lined locker. The guest/day head lie forward and is complete with Vacu flush marine toilet and separate shower stall. The master stateroom has huge island double with lighted cedar lined lockers port and starboard along with drawer storage and another television with DVD player. The private en-suite head also features Vacuflush toilet and separate shower stall with ample storage.